Before you ask, no, this isn’t a reaction to this morning’s ESPN report claiming LeBron James would be willing to meet with the Golden State Warriors once he becomes a free agent this summer. Since discussing the possibility of this sends me into a white rage, I’m just going to avoid getting into that. Also, if everyone could stop sending me photo-shopped pictures of James in a Warriors jersey, it’d be very much appreciated. Anyways, as we get closer to the much-anticipated next round of wondering where James will sign, navigating through a miserable Cleveland Cavaliers season to get there, the rumors are starting to pop up at an alarming rate. Honestly, I don’t have a clue where James is going to end up. What I do know is, when claiming he should stay with the Cavs, it’s difficult to explain why. This is basically due to the fact the reasons he should re-sign with Cleveland are few and far between. None of this is inaccurate. However, can you name a reason outside of the hometown aspect? Can you explain why staying with the Cavs will still give him the best shot to win more championships? For one, we already know the current iteration of this team can’t keep up with the Warriors. Hell, it can barely keep up with the Orlando Magic. The roster is the oldest in the NBA, and it shows on a nightly basis. Even if the Cavs shake out of this unwatchable funk they’ve endured and gut their way back to the Finals, odds overwhelmingly favor another rematch with Golden State being a quick one. Sure, Cleveland could make a move by next week’s trade deadline, but with what assets? The team’s own first-round pick could net some complementary help, as would offering up Tristan Thompson or Iman Shumpert. It certainly won’t be a game-changing move, though. The Cavs do own the coveted Brooklyn Nets 2018 first-rounder, but are wisely resisting the urge to part with it. If anything, dealing it for a temporary fix which won’t help Cleveland’s championship odds will only increase the odds James flees come July. Even the aforementioned loyalty argument is flawed, mostly due to the fact James’ relationship with owner Dan Gilbert is as shaky as ever. Gilbert, while never hesitating to open his wallet, has made a series of moves which certainly won’t convince anyone Cleveland can keep contending. 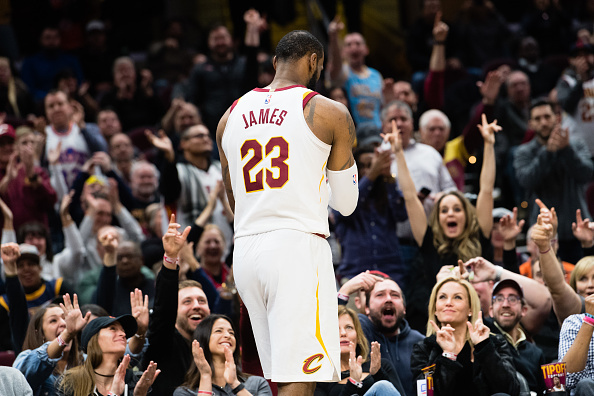 Though the hefty contracts practically every player on the roster carries were provided to appease James, they also severely limit anything the Cavs can do in the offseason. Meanwhile, letting former GM David Griffin walk out the door last summer looks more foolish by the day. Throughout the constant noise about how ugly things are in Cleveland’s locker room, all we keep hearing is how effective Griffin would’ve been at putting out all the fires. Essentially, if James claimed his departure from Cleveland was a result of the soured relationship between himself and Gilbert, nobody could blame him. There was a time when I would confidently note staying with the Cavs would still be James’ best bet in making it to the Finals. However, even this claim has derailed. The Boston Celtics – thanks to their out-right fleecing of Cleveland in the Kyrie Irving trade – are the class of the Eastern Conference right now. Thanks to a young core, great coach, tons of assets and the impending return of Gordon Hayward, this won’t be changing anytime soon. While Boston will only get better, all Cleveland can really do this summer is shed contracts. Even if the Cavs retain the Brooklyn pick, they’ll need tons of lottery luck for it to land high enough to net an impact rookie. So you have a team which can’t afford to sign big free agents, has very little in terms of trade assets, is extremely old and is slowly becoming an also-ran in its own conference. The only solution for this appears to be depending on the eighth or ninth best player in the upcoming draft. Cavs fans better hope James puts a hell of a lot of stock in loyalty. Otherwise, it sure looks like the least likely outcome is him staying in Cleveland after this season.